originally produced at McCarter Theatre Center, Princeton, NJ. It’s a lovely day at Vanya and Sonia’s farmhouse in Bucks County, PA. But instead of spending the morning strolling through their cherry orchard, these wacky siblings have their hands full with a prophetic cleaning woman, a neighborhood costume party, and a surprise visit from their movie-star sister Masha and her studly new boy-toy, Spike. Comic genius Christopher Durang (Miss Witherspoon, Beyond Therapy) makes a spectacular return to McCarter Theatre with this hysterical world premiere that turns Chekhov on its head. Durang’s signature blend of neuroses and absurdity has never been more endearing...or relentlessly funny. 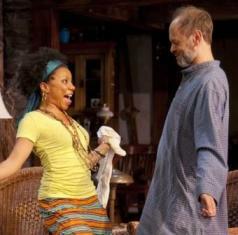 Vanya and Sonia and Masha and Spike is Durang at his satiric best—witty and wacky and surprising—while at the same time filled with the pathos and emotional truth characteristic of the plays of Chekhov. It is this infusion of Chekhovian style that separates this play from Chris’ earlier work, allowing him to first poke fun at, but ultimately embrace Chekhov’s lyric imagery. What I love most about the play is how funny it is. The first time I heard it out loud, I (and everyone around me) was hysterical with laughter. The power of the humor lies in its truthfulness, and I’m afraid that each of us can find a piece of ourselves in this play. Chris manages, in the most sophisticated way, to use comedy to probe the human condition. In doing so, he delivers a play of great insight, beauty and humor. He draws upon Chekhovian themes (longing, effects of social change, frustrated hopes and wasted lives) along with his own experience as an artist in middle age to create a play that is funny and deeply personal. Because this production will likely include several high-profile actors, the primary rehearsal challenge we face is scheduling. As with any new play, an extra week of rehearsal will give us the much-needed ability to learn from the actors and continue to finesse the play. Comedy is an especially elusive form to understand without the performers in the room together, and there is only so much work a writer can do without actors. There is no replacement for that time in any process, and especially in the creation of a world premiere comedy. This extra week of rehearsal would play a significant role in helping our cast become comfortable with both the idiosyncratic humor of the piece and the rich details of the relationships that exist among the characters.